* We currently have 1 of these rig kits IN STOCK, and can be shipped SAME DAY if ordered by 1pm EST. The McDonagh is a giant blood cannon. This is the rig to use if you need to cover a room with a shower of blood! The rig can easily fire up to a 1/2 gallon of blood at once. Built using sturdy professional grade materials, it is reliable, durable, and simple to maintain. It can be positioned off-camera, behind an off-camera part of the body, or built into props or the set. The most popular use is to insert the rig into the neck of a fake head to create a head explosion! 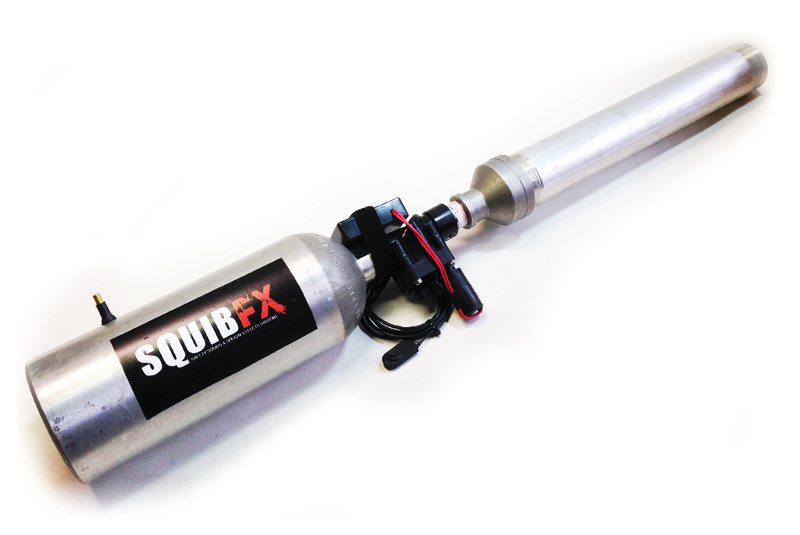 The air chamber is manually pumped using a bike pump or compressor, allowing for adjustable air pressure. Adjustable air pressure and blood volume allows the user to design exactly the kind of blood blast they want. The 2" diameter 24" blood barrel allows for up to 1/2 gallon of blood volume, but can be adjusted as per the design of the blood blast the user desires. The trigger is hard wired with a waterproof switch, putting the control right in the perfomer's hands. At 5' long, it is also long enough to be easily fired by another operator. Comes complete with everything you need to get started, including: a small hand air pump and 1 pint of stage blood. Remember that blood is an expendable! Usable thousands of times if properly maintained. THERE IS A 6 MONTH REPAIR WARRANTY FOR ANY MANUFACTURER DEFECTS. OTHERWISE ALL SALES ARE FINAL. THE INSTRUCTIONS AND PRACTICE! FAILURE TO OPERATE DOES NOT WARRANT A REFUND. THESE RIGS WORK AWESOME, AND IF YOU'RE HAVING TROUBLE PLEASE CONTACT US! WE AREN'T LIABLE IF YOU DIDN'T GIVE YOURSELF ENOUGH TIME TO PRACTICE OR YOU DIDN'T READ THE INSTRUCTIONS OR YOU DIDN'T CALL US WHEN YOU WERE HAVING DIFFICULTY.